The Rogue Folk Club has put together something truly special to kick off their second annual Driven Bow Festival! Four of the best fiddlers that the province has to offer, playing all evening in various combinations, singles, duos, trios, the sky's the limit. Between all the great players here, you might hear Celtic, Quebcois, bluegrass, folk, Métis, country, Irish, Scottish, world music and probably more. This is a fiddle fanatic's fantasy! 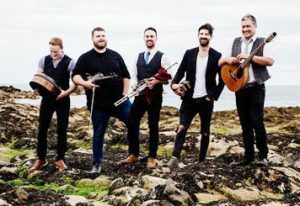 With the release of the new album Rove, Nova Scotia's powerhouse Còig (KO-ig) has cemented its status as one of today’s most exciting new North American Celtic groups. With a combined total of over 30 group and solo awards and nominations, the four members of the band are already recognized as major stars of the Celtic world. Rove is drawing rave reviews from fans and critics and has recently been recognized with a 2018 East Coast Music Award for Traditional/Roots Recording of the Year, a 2018 Juno Award nomination, and 2017 Canadian Folk Music Award and Music Nova Scotia Award nominations. Còig's like no other, thanks to the unique mix of four different talents. They all have traditional roots, but each brings something more. Fiddler Chrissy Crowley has touches of world and contemporary music. Pianist Jason Roach has a jazz degree, Darren McMullen (guitar, banjo, mandolin, etc.) has worked everywhere from Irish to rock groups, and fiddler Rachel Davis is the most Cape Breton trad, but with folk and roots infused flavours as well. 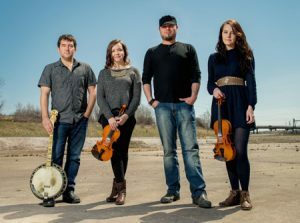 The group’s debut Five, released in June, 2014, earned them the 2014 Canadian Folk Music Award for Traditional Album of the Year, the Music Nova Scotia Award for Traditional/Roots Recording of the Year, and the 2015 East Coast Music Award for Roots/Traditional Group Recording of the Year. That was followed by 2015’s Carols, already a yearly holiday favourite. 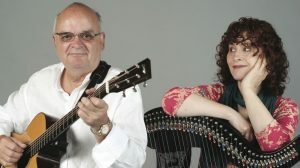 Ask anyone who has seen them, from New England theatre stages to huge European festivals to their own beloved small halls of Cape Breton, and you'll always hear about Còig's energy. Trad fans love them of course, and the crowds are growing all the time. "We really feed a lot on the energy we get from the crowd, everybody is hootin' and hollerin' and clappin' and stompin' and goin' on," says multi-instrumentalist Darren McMullen. "We want our shows to be more where we're all just having a party together." 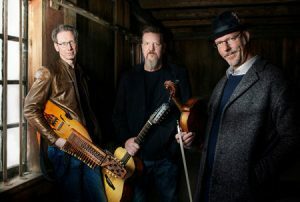 Còig's music is a unique combination of influences that could only come from these four players. It's traditional for sure, but it's performed in a lot of non-traditional ways. 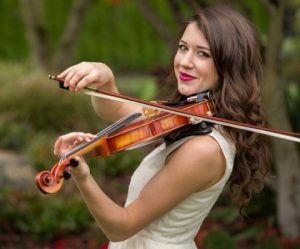 "We all come from sort of a traditional background, but then we have different influences that we're interested in," explains fiddler and singer Rachel Davis. "Jason (Roach, pianist) has a jazz degree, and listens to a lot of different music. Chrissy (Crowley, fiddler) likes to dive into a lot of world music, Darren (mandolin, guitar, banjo, etc.) comes from a kind of Irish theme from playing around Halifax. 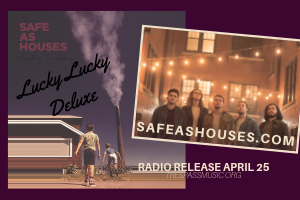 More of the traditional Cape Breton stuff is really what I love, plus all the folk songs, so it's an interesting mix.” Rove sees the group move from playing all instrumentals to including several vocals, from both Davis and McMullen. Crowley says they all knew Davis had a lovely voice, but she had to be coaxed into it. "In her mind she could sing a little bit, so the songs got staggered slowly into the show. With every performance somebody would say that it adds to the energy." Originally created as a way of “bringing it down a bit”, Boxcar Campfire has taken on a life of its own as this new recording and touring project allows a more reflective and insular shade of Paul Pigat’s creativity to come into play. Those with sharp ears will hear snatches of everything from Debussy to Jimmy Rogers blues inflections thrown into the mix, but — as always — the sounds Pigat creates are all his own. Blessed with a jazz man’s sheen, a rockabilly heart and a hobo’s soul, there aren’t many genres of music that don’t pull at Pigat’s wayfaring imagination like a magnet. With long gone days of railroad steam trailing out back of his head as he sings of possums in the pot and holes in his heart, this music gets you in the mood to hit the open road. Set for release on March 22, 2019, The Game is Paul’s second instalment of what will be the Boxcar Campfire trilogy. Full of imagery of the open road and a rapscallion’s slant on the human condition, Pigat takes the listener on an acoustic journey with a distinctly bluesy tinge filled with humour and insight. With Pigat on vocals, guitars and harmonicas, with special guest Marc L’Esperance on additional vocals and percussion, 'The Game' features seven originals and three reimagined and exceptionally creative covers, including a brilliant rendition of Johnny Cash’s Ring of Fire. 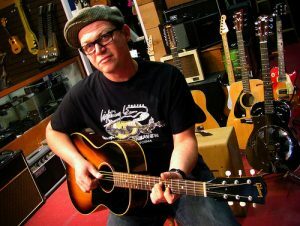 The Boxcar Campfire trilogy was born in 2009 with the self titled first solo recording Paul Pigat’s Boxcar Campfire. It gained critical acclaim and was a unexpected departure from Pigat’s more well known alter ego, Cousin Harley. The Game is a direct continuation of that first recording but with a distinctly more satirical flavour. Reminiscent of the great works of Hoyt Axton and Randy Newman, Pigat’s latest offering is stripped down, sometimes introspective, sometimes humorous and always entertaining. 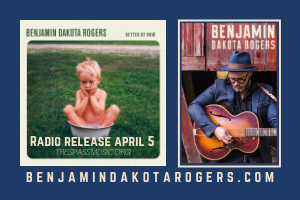 Kat Danser’s music is a steel belted radial easily flexing between a dusty gravel road and a fresh coat of asphalt. 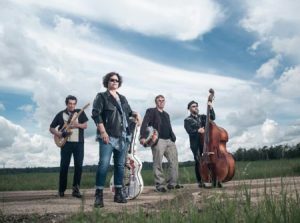 True to her Polish-Gypsy heritage, Danser is in perpetual motion and her swampy roots and blues style is a fine-tuned reflection of life lessons from the road. Edmonton’s Kat Danser doesn’t just play the blues - she studies it, lives it, breathes it and elevates it from sweaty, smoky beer joints to elegant centre stage in the finest of concert halls. Her sweet vocals, lyrical genius, and instrumental prowess beautifully combine with her sharp wit and commanding stage presence to deliver unfailingly memorable live performances. Her fifth album, Goin’ Gone, is a collaboration between Danser and multi Juno award winning producer Steve Dawson and is on Black Hen Music and distributed by True North Records. This recording is a highly energetic album that sits the listener right beside her on the vinyl seat of a 1949 Ford Lead Sled as she rolls and rumbles through the Deep South, USA. It celebrates her passion for the roots of blues music and her achievements as a graduate student at the University of Alberta where she has now officially become Dr. Kat Danser with a PhD in Ethnomusicology. A national touring and award-winning artist, Danser has performed at the 25th Anniversary of Canadian Women in Blues at Massey Hall in Toronto, the Calgary International Blues Festival, Winnipeg Folk Festival, Edmonton Folk Music Festival, Calgary Folk Festival, Vancouver Folk Festival, Salmon Arm Roots & Blues Festival, Folk on the Rocks Festival in Yellowknife, Regina Folk Festival, Saskatoon Blues Festival, Lethbridge Jazz Festival, Vancouver Island MusicFest, The Winspear Centre’s ‘Mayor’s Celebration of the Arts’, Lunenburg Folk Harbour Festival, Harmony Bazaar Festival, Mountainview Music Festival, Islands Music Festival, and the Winter Roots & Blues Festival. Her accolades have been many. 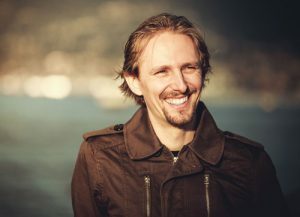 Danser is a three time nominee for a Western Canadian Music Award and a national Maple Blues Award - Best New Artist of the Year, winner of the Ambassador of the Blues Award (Blues Underground Network) and the International Blues Competition Best Independent Blues Album, as well as being voted to have made one of the Top 5 Roots & Blues Albums of 2014 (CBC Radio & Blues Underground Network). Kat Danser is also a nationally award winning scholar and has presented at conferences throughout North America. She combines her performance and education skills to assist community building between marginalized peoples and educational institutions. Toward that end, Danser has been the Artist in Residence at the EPCOR Centre for the Performing Arts (Calgary), facilitated music and healing at the U-School Program for Marginalized Youth and the Foothills Youth Psychiatric School, and instructs her own Music Education Program across the lifespan from elementary schools to adult instructional camps. Danser’s primary goal is to use music as a space for personal exploration and as a method to strengthen intercultural relationships. The show is on the road, and coming to Vancouver. This will be a special night, as producer Steve Dawson himself will leading the band on the CD release show. This is a rare opportunity to see the prodigal son return, as his move to Nashville has precluded the Vancouverites from hearing him around here much any more. Community of Songs is a metro Vancouver wide community songwriting program. It was designed and is being facilitated by Canadian wandering minstrel Michael Averill, in partnership with The Rogue Folk Club. Michael has been leading songwriting workshops with various community groups as young as 10 years old, up to folks in their 70s. There are 8 different groups in total, all of which have been given the same challenge: Write a song with the theme of “Community.” The completed songs will be performed at a final show held at St. James Hall on April 5th, 2019. All groups will be in attendance. The intention for this project and final event is to provide space and structure for a wide range of perspectives, ages, stories, and walks of life to share their voices. Strengthening community through creativity and song. It will be an inspiring experience, and a chance for many in the region to shine on the legendary stage of St. James Hall. A wonderful group of active community focused songwriters and musicians (Tonye Aganaba, Bre McDaniel, Corrina Keeling, Michael Averill, and Sharanjeet Singh Mand) will also be sharing their powerful stories and songs about the topic. A few special guests, collaborations, and surprises are to be expected.